Domestic Frames There are 17 products. 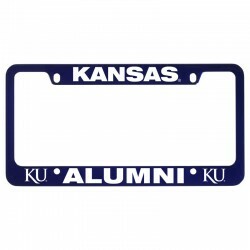 Whether you’re a car dealership looking to promote your business, or a university excited about your alumni or athletics programs, a custom, laser-engraved license plate frame from Sutter’s Mill Specialties is just what you need. With multiple colors and sizes available to fit any standard, domestic license plate, these plate frames are a long-lasting, highly visible promotional product. This customized license plate frame is made from durable plastic with a shining chrome finish, and features your brand and logo on the top and bottom bars in a silver on black style. 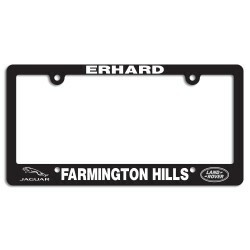 This customized license plate frame is made from durable plastic with a shining chrome finish, and features your brand and logo on the top and bottom bars in a black recessed text style. 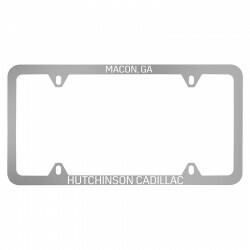 This customized license plate frame features stainless steel construction and a gleaming polished shine that draws attention to your brand and logo. This model has a narrow top bar over a narrow bottom bar, and is compliant with all fifty states! 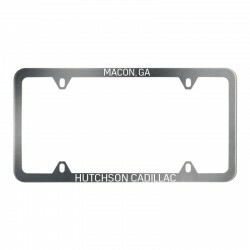 This customized license plate frame features stainless steel construction and a gleaming polished shine that draws attention to your brand and logo. This model has a narrow top bar over a large bottom bar. 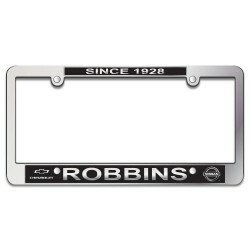 This sleek personalized license plate frame will display your brand and logo on the top and bottom bar, and is a great affordable promotional product. Multiple styles available! 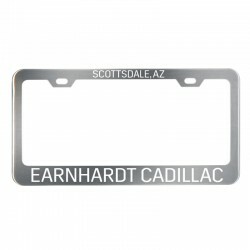 This personalized license plate frame is made from solid, brushed stainless steel and your laser-engraved brand on the top and bottom. This model features a narrow top bar over a large bottom bar. 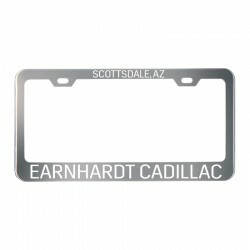 This personalized license plate frame is made from solid, brushed stainless steel and your laser-engraved brand on the top and bottom. This model features a narrow top bar over a narrow bottom bar, and is compliant with all fifty states! 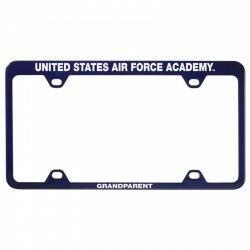 Show your school pride or promote your business with this personalized, solid color license plate frame, available in multiple colors. This model features a medium top bar over a large bottom bar. 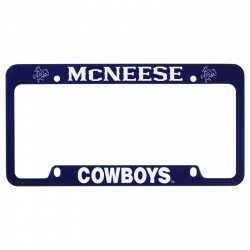 Show your school pride or promote your business with this personalized, solid color license plate frame, available in multiple colors. This model features a large top bar over a medium bottom bar. Show your school pride or promote your business with this personalized, solid color license plate frame, available in multiple colors. This slim-line model features a small top bar over a medium bottom bar. Show your school pride or promote your business with this personalized, solid color license plate frame, available in multiple colors. This slim-line model features a medium top bar over a small bottom bar. 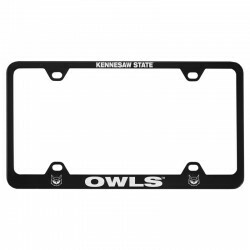 These sturdy metal license plate frames feature your custom-engraved college name and logo, company, or any other personalization you want, on a selection of available color backgrounds. This model features a large top bar over a medium bottom bar.